Rock & Sole Plaice is London's oldest fish and chip restaurant, just a short walk along a quiet street from the Covent Garden market. Since fish and chips is one of England's national dishes, and you really can't visit the city without indulging in a plate or two. And if you're going to indulge, why not try the place that started the trend? Although you'll also find pies and sausage on the menu, what you came here for is the fried stuff, so stick to the fish. Rock & Sole Plaice fries up seven different kinds of fish including haddock, skate halibut, rock, cod, lemon sole, and of course plaice. There's a regular and a large size for all but the halibut, and the prices varies depending on which fish you choose. What they do have in common is that they're all dipped in thick batter and fried to a golden brown perfection. Each plate also comes with a hearty side of thick cut fries, and plenty of tartar sauce and lemon to go around. Nothing at Rock & Sole Plaice is fancy, this is, and always will be a causal family type joint. The top level has a few seats, and is also where you'll find the fryer station and cash register. Since this is a pretty popular place the restaurant fills up fast, especially around dinner, but if you can snag a table outside, that's the most pleasant place to enjoy your meal. If the patio and top level is full, make your way downstairs where you'll find a few extra tables, along with a pretty tacky under-the-sea wall mural that cements the whole casual dinning experience. Sadly because of the popularity of Rock & Sole Plaice there are a lot of tourists, which means the prices are a bit on the high side. 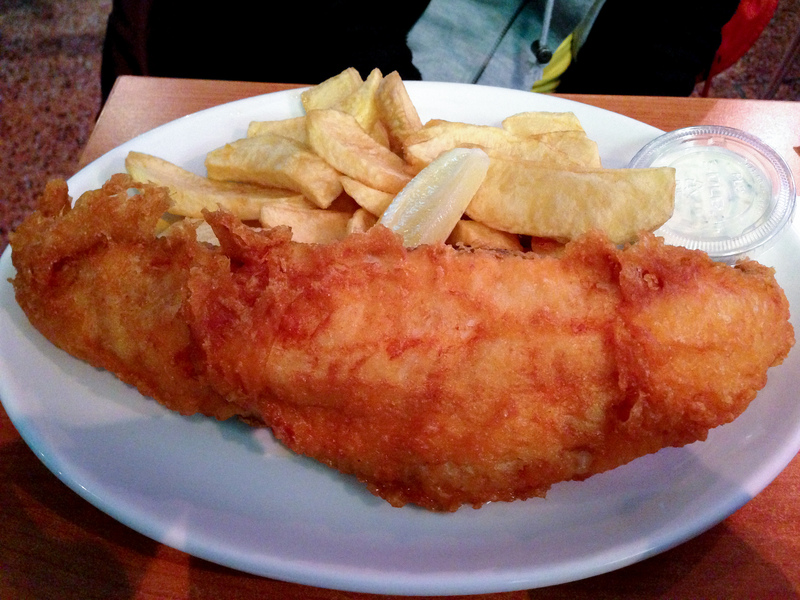 Most dishes are between £13.50-20, pretty steep for fish and chips, especially considering the causal atmosphere. On the bright side, we had the regular size plate at £13.50, and it was all we needed to leave full and happy.